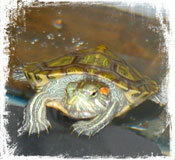 This website and the Turtle Talk forum are primarily dedicated to the care of Red Ear Sliders (Trachemys scripta elegans). All topics will cover sliders but are also applicable to similar variants of semi-aquatic turtles. The primary topics that are discussed on this site are basic slider information, basic care, nutrition, habitat, water quality, water filtration, special lighting, basking and health concerns. All of these topics are relevant to proper care. The resources of this website are provided by experienced keepers and are based on references of similar interests. We strongly recommend that you conduct further research to find greater information regarding the proper care of your particular turtle(s). Please keep in mind that not all sites or veterinary professionals will provide similar suggestions and content. We will do our best to keep our information accurate and up-to-date; however we do not plan on offering extensive medical information. The reason behind this decision is that we recommend keepers seek qualified and professional help regarding serious and life-threatening situations. It is the responsibility of the turtle’s owner to seek out this care and knowledge promptly. U.S. Veterinary listings are available here. You will find that the Red Ear Slider has very specialized requirements that are necessary for you to provide. There will be instances where extra care is warranted for either you or your turtle’s safety and it will be indicated with this label: . If you recently acquired a slider, please understand that proper care is vital for the health of your turtle. 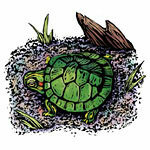 Care for young turtles, especially hatchlings, has little margin for error. If you have a hatchling, chances are you were led to believe they are easy to keep and don't grow too large. A nice, but useless, starter kit may also have been bought. Hopefully such misleading information has not caused any harm and you can still learn what is required to maintain a healthy turtle environment. Quick links to printable guides for new owners (what to get, estimated costs, budget options, what to feed) are available here. Please understand that most turtle sellers have little or no knowledge regarding turtle care, pet stores may have incorrect or outdated information and not all veterinarians are qualified to treat reptiles. Veterinarians trained for “exotic species” may not have in-depth information or resources regarding red ear sliders. While turtle keeping may seem simple, it can be complicated and expensive, especially if your red ear slider (RES) becomes sick. Medical care may be required, and as the owner of any pet or animal, you have an obligation to seek qualified help and support when it is needed. Turtles are not disposable pets that can be placed in a bowl or released into the wild. They experience pain, discomfort and psychological stress. Unfortunately, RES are very inexpensive to acquire and easily found, but I hope this site can provide some guidance. Turtle Talk, the moderated forum of redearslider.com, is a great place to discuss turtles and I highly encourage you to visit. Thanks to the moderators. You are instrumental to this site. Also thanks to the forum members; your contributions are greatly appreciated. And thanks to you for reading. Please continue to the sections that interest you or head to the Site map for a list of all topics. Note: Redearslider.com and the Turtle Talk forum do not permit solicitors from posting or linking any site, business or individual (this applies to hobbyists) that sells turtles or related goods.